The best bit of my weekend was eating home made penguin waffles, smothered in either butter or maple syrup. Yum! Abbey would say the best bit of her weekend was dressing up, wearing lip gloss, being taken out to dinner by Nanny and Grandad and then being taken to see Mary Poppins the musical. She had a magical evening out, and talked about it all day Sunday. Pop in an visit Claire for more weekend fun. How cool - how did you make them into penguins? 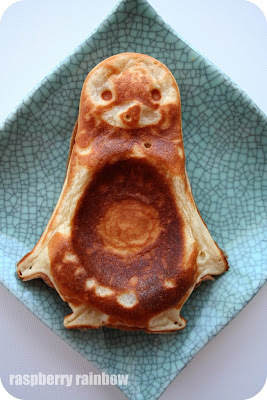 Silly me - I put a link up now, to the company who makes the penguin waffles makers. Yummy! We like to put ice cream in their little tummies!! yum!! Lucky Girl! What a fabulous way to to treat a girl to a bit of culture! :)... now can you ask them to treat me to some? lol! So lovely to see you back here in the blogosphere :) I missed you Cat!! I think the penguin waffle maker might make an appearance for Doots' birthday in July. She's crazy for penguins, and pancakes. How lovely for your girl to have dinner and a show with her grandparents. Sounds like a night to remember! Oh, and forget about my question, I'm just catching up with your Hong Kong story now!